For other uses, see Irkutsk (disambiguation). Irkutsk (Russian: Иркутск, IPA: [ɪrˈkutsk]; Buryat and Mongolian: Эрхүү, Erhüü) is the administrative center of Irkutsk Oblast, Russia, and one of the largest cities in Siberia. Many distinguished Russians were sent into exile in Irkutsk for their part in the Decembrist revolt of 1825, and the city became an exile-post for the rest of the century. Some of the fine wooden houses still survive, contrasting with the dominant Soviet architecture. When the railway reached Irkutsk, it had earned the nickname of "The Paris of Siberia." The city saw bitter fighting in the Russian Civil War of 1918-20, and then became a major centre of aircraft manufacture. Trans-Siberian Highway (Federal M53 and M55 Highways) and Trans-Siberian Railway connect Irkutsk to other regions in Russia and Mongolia. Irkutsk was named after the Irkut River, whose name was derived from the Buryat word for "spinning" and was used as an ethnonym among local tribes as Yrkhu, Irkit, Irgit, and Irgyt. The city was formerly known as "Yandashsky" after the local Tuvan chief Yandasha Gorogi. The old spelling of the name of the city was «Иркуцкъ». Before the revolution, the city was called "East Paris", "Siberian Petersburg", "Siberian Athens". Locals like to think of their city as "middle of earth". In 1652, Ivan Pokhabov built a zimovye (winter quarters) near the site of Irkutsk for gold trading and for the collection of fur taxes from the Buryats. In 1661, Yakov Pokhabov built an ostrog (a small fort) nearby. The ostrog gained official town rights from the government in 1686. The first road connection between Moscow and Irkutsk, the Siberian Route, was built in 1760, and benefited the town economy. Many new products, often imported from China via Kyakhta, became widely available in Irkutsk for the first time, including gold, diamonds, fur, wood, silk, and tea. In 1821, as part of the Mikhail Speransky's reforms, Siberia was administratively divided at the Yenisei River and Irkutsk became the seat of the Governor-General of East Siberia. In the early 19th century, many Russian artists, officers, and nobles were sent into exile in Siberia for their part in the Decembrist revolt against Tsar Nicholas I. Irkutsk became the major center of intellectual and social life for these exiles, and much of the city's cultural heritage comes from them; many of their wooden houses, adorned with ornate, hand-carved decorations, survive today, in stark contrast with the standard Soviet apartment blocks that surround them. By the end of the 19th century, there was one exiled man for every two locals. People of varying backgrounds, from members of the Decembrist uprising to Bolsheviks, had been in Irkutsk for many years and had greatly influenced the culture and development of the city. As a result, Irkutsk eventually became a prosperous cultural and educational center in Eastern Siberia. In 1879, on July 4 and 6, the palace of the (then) Governor General, the principal administrative and municipal offices and many of the other public buildings were destroyed by fire, and the government archives, the library and the museum of the Siberian section of the Russian Geographical Society were completely ruined. Three-quarters of the city was destroyed, including approximately 4,000 houses. However, the city quickly rebounded, with electricity arriving in 1896, the first theater being built in 1897 and a major train station opened in 1898. The first train arrived in Irkutsk on August 16 of that year. By 1900, the city had earned the nickname of "The Paris of Siberia." During the Russian Civil War, which broke out after the October Revolution, Irkutsk became the site of many furious, bloody clashes between the "Whites" and the "Reds". In 1920, Aleksandr Kolchak, the once-feared commander of the largest contingent of anti-Bolshevik forces, was executed in Irkutsk, which effectively destroyed the anti-Bolshevik resistance. Irkutsk was the administrative center of the short-lived East Siberian Oblast, which existed from 1936 to 1937. The city subsequently became the administrative center of Irkutsk Oblast after East Siberian Oblast was divided into Chita Oblast and Irkutsk Oblast. During the communist years, the industrialization of Irkutsk and Siberia in general was heavily encouraged. The large Irkutsk Reservoir was built on the Angara River between 1950 and 1959 in order to facilitate industrial development. The Epiphany Cathedral, the governor's palace, a school of medicine, a museum, a military hospital and the crown factories are among the public institutions and buildings. The Aleksandr Kolchak monument, designed by Vyacheslav Klykov, was unveiled in 2004. On July 27, 2004, the Irkutsk Synagogue (1881) was gutted by a conflagration. In December 2016, 74 people in Irkutsk died in a mass methanol poisoning. In 2018, it was reported men in Irkutsk only survive on average to 63. Irkutsk is located about 850 kilometres (530 mi) to the south-east of Krasnoyarsk, and about 520 kilometres (320 mi) north of Ulaanbaatar, the capital of Mongolia. The city proper lies on the Angara River, a tributary of the Yenisei, 72 kilometers (45 mi) below its outflow from Lake Baikal and on the bank opposite the suburb of Glaskovsk. The river, 580-meter (1,900 ft) wide, is crossed by the Irkutsk Hydroelectric Dam and three other bridges downstream. The Irkut River, from which the town takes its name, is a smaller river that joins the Angara directly opposite the city. The main portion of the city is separated from several landmarks—the monastery, the fort and the port, as well as its suburbs—by another tributary, the Ida (or Ushakovka) River. The two main parts of Irkutsk are customarily referred to as the "left bank" and the "right bank", with respect to the flow of the Angara River. Irkutsk is situated in a landscape of rolling hills within the thick taiga that is typical in Eastern Siberia. The population has been shrinking: 587,891 (2010 Census); 593,604 (2002 Census); 622,301 (1989 Census).. According to the regional plan, Irkutsk city will be combined with its neighboring industrial towns of Shelekhov and Angarsk to form a metropolitan area with a total population of over a million. Irkutsk originally had a borderline subarctic climate (Köppen climate classification Dwc). Since 2000, the temperatures have resembled a humid continental climate (Köppen climate classification Dwb). Snow cover disappeared earlier, from late April in the 1930s to late March in the 1980s. Discontinuous permafrost depth had decreased from 200 m to 100 m during the same period. Irkutsk is characterized by an extreme variation of temperatures between seasons. It can be very warm in the summer, and very cold in the winter. However, Lake Baikal has a tempering effect thanks to which temperatures in Irkutsk are not as extreme as elsewhere in Siberia. The warmest month of the year is July, when the average temperature is +18 °C (64 °F), the highest temperature recorded being +37.2 °C (99.0 °F). The coldest month of the year is January, when the average temperature is −18 °C (0 °F), and record low of −49.7 °C (−57.5 °F). Precipitation also varies widely throughout the year, with July also being the wettest month, when precipitation averages 113 millimeters (4.4 in). The driest month is February, when precipitation averages only 7.6 millimeters (0.30 in). Almost all precipitation during the Siberian winter falls as flurry, dry snow. Irkutsk is the administrative center of the oblast and, within the framework of administrative divisions, it also serves as the administrative center of Irkutsky District, even though it is not a part of it. 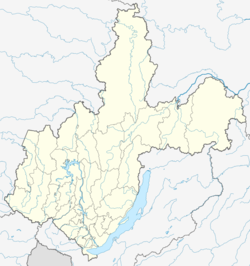 As an administrative division, it is incorporated separately as the City of Irkutsk—an administrative unit with the status equal to that of the districts. As a municipal division, the City of Irkutsk is incorporated as Irkutsk Urban Okrug. 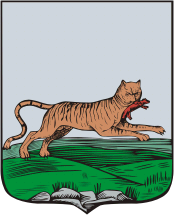 The coat of arms of Irkutsk features an old symbol of Dauria: a Siberian tiger with a sable in his mouth. When the coat of arms was devised in 1690, the animal was described as a tiger ("babr", a bookish word of Persian derivation) with a sable in his mouth. This image had been used by the Yakutsk customs office from about 1642. It has its origin in a seal of the Siberia Khanate representing a sable and showcasing the fact that Siberia (or rather Yugra) was the main source of sable fur throughout the Middle Ages. (Actually, the English word "sable" is derived from the Russian "sobol"). By the mid-19th century, the word "babr" had fallen out of common usage, but it was still recorded in the Armorial of the Russian Empire. Furthermore, the tigers became extinct in this part of Siberia. In the 1870s, a high-placed French heraldist with a limited command of Russian assumed that "babr" was a misspelling of "bobr", the Russian word for "beaver", and changed the wording accordingly. This modification engendered a long dispute between the local authorities, who were so confused by the revised description that they started to depict the "babr" as a fabulous animal, half-tiger and half-beaver. The Soviets abolished the image altogether, but it was restored following the dissolution of the Soviet Union. The 662.4 MW Irkutsk Hydroelectric Power Station was the first cascade hydroelectric power station in the Irkutsk region. The construction of the dam started in 1950 and finished in 1958. The largest industry in Irkutsk is Irkut, the Irkutsk Aviation Industrial Association, which was set up in 1932 in the Transbaykal region of the Soviet Union. It is best known as being the manufacturer of the Su-30 family of interceptor/ground-attack aircraft. The Russian government has merged Irkut with Ilyushin, Mikoyan, Sukhoi, Tupolev, and Yakovlev into a new company named United Aircraft Building Corporation. There is the Irkutsk Aluminium Smelter which belongs to the Rusal Company. Important roads and railways like the Trans-Siberian Highway (Federal M53 and M55 Highways) and Trans-Siberian Railway connect Irkutsk to other regions in Russia and Mongolia. The city is also served by the Irkutsk International Airport and the smaller Irkutsk Northwest Airport. The Federal road and railway to Moscow and Vladivostok pass through the other side of the Angara River from central Irkutsk. Trams are one major mode of public transit in Irkutsk. Other modes are trolleybus, bus, fixed-route taxi (marshrutka) and cycling. There are many state-owned and privately owned television stations in Irkutsk, including state company IGTRK and private ones, such as AS Baikal TV, TV company AIST, TV company Gorod, and also other media outlets, like the VSP Newspaper Agency. There is also a live webcam broadcasting from the city center. Irkutsk is home to the East Siberian Education Academy (since 1909), Irkutsk State University (1918), Irkutsk State Medical University (1918), Baykalsky State University of Economics and Law (since 1932), Irkutsk State Technical University (since 1939), Irkutsk State Academy of Agriculture, Irkutsk State Linguistic University (1948), Irkutsk State Railway Transport University (since 1975), and a number of private colleges: Siberian Institute of Law, Economics and Management (since 1993), Institute of Economics of ISTU (since 1996), and others. As Irkutsk is within the influence of the Siberian Division of the Russian Academy of Sciences, there are nine research institutes located in the Irkutsk Academgorodok suburb: the Institute of Geography, the Energy System Institute, the Institute of Geochemistry, the Institute of System Dynamics and Control Theory, the Earth's Crust Institute, the Solar-Terrestrial Physics Institute, the Institute of Chemistry, the Limnological Institute (formerly located on Lake Baikal's shore), the Institute of Plant Physics, Laser Physics Institute (a Branch of the Institute of Laser Physics in Novosobirsk). A number of institutes conduct research within Irkutsk State University: the Institute of Biology, the Institute of Oil and Coal Chemistry and Synthesis, the Laboratory of Quantum Chemistry, the Institute of Applied Physics, the Interregional Institute of Social Studies, the Astronomical Observatory, and the Botanical Gardens. The East-Siberian Scientific Center of the Russian Academy of Medical Sciences is also located in Irkutsk and is represented by the following research organizations: the Scientific Center for Medical Ecology, the Institute for Paediatrics and Human Reproduction, the Institute for Microbiology and Epidemiology, the Institute for Medicine of the Workplace and Human Ecology, the Institute of Reconstructive and Restorative Surgery, the Institute of Surgery, and the Institute of Traumatology and Orthopaedics. Also, the Fyodorov Eye Microsurgery Scientific and Technical Center has a branch in Irkutsk. Additionally, there are R&D institutes including GAZPROM R&D Institute (a Branch of a Moscow-based institute), the Irkutsk Institute of Rare and Precious Metals and Diamonds (Irgiredmet), part of the Petropavlovsk Group of Companies., and the Vostoksibacademcenter of the Russian Academy of Architecture and Construction Sciences that publishes the Project Baikal journal. Irkutsk was home to the well-known Russian writer Valentin Rasputin; many of his novels and stories take place in the Angara Valley. An essay on the cultural history of Irkutsk (and another one about the nearby Lake Baikal) is included in Rasputin's non-fiction collection Siberia, Siberia, which is also available in an English translation. Irkutsk is a point of interest for tourists with its numerous museums and old architecture. The Taltsy Museum (Russian: Тальцы), located on the Angara 47 kilometers (29 mi) South of Irkutsk, is an open-air museum of Siberian traditional architecture. Numerous old wooden buildings from villages in the Angara valley, which have been flooded after the construction of the Bratsk Dam and Ust-Ilimsk Dam, have been transported to the museum and reassembled there. One of the centerpieces of the collection is a partial recreation of the 17th-century ostrog (fortress) of Ilimsk, which consists of the original Spasskaya Tower and the Church of Our Lady of Kazan transported from the flooded ostrog in the mid-1970s, to which an exact modern copy of another tower of the ostrog and the Southern wall of the fortress were added in the early 2000s. The Botanic Garden of the Irkutsk State University known as the "Irkutsk Botanic Garden" is the only botanic garden as a living museum in Irkutsk Oblast and Baikalian Siberia. Its mission is "to protect and enrich the flora of the Lake Baikal area and the world for people through public education, collection, propagation, research, and conservation of plants". The garden is mainly an educational and scientific tool for the Irkutsk State University and maintains the largest plant collection of living plants in Eastern Siberia (more than 5000 plant taxa), a herbarium, and a seed bank. It occupies 27 hectares within Irkutsk city, 70 km (43 mi) West of Lake Baikal. It has a federal status of especially protected land and a nature memorial of Irkutsk. Irkutsk is also home to several theaters, including the Okhlopkov Drama Theater, one of Russia's oldest. Bandy is popular in the city. There are several clubs, most notably Baykal-Energiya of the Russian Bandy Super League, which can draw spectator crowds of 30,000. It is also the centre of women's bandy in Russia with the club Rekord, which provides most players to the national team. In Irkutsk, there are 384 sports facilities, of which 200 are municipal ones. Among them there are 23 swimming pools, 14 ski bases, a sports palace, 154 courts, 165 gyms, an athletics arena, a racetrack, 7 stadiums — Trud, Rekord, Dynamo, Zenit, Aviator, Lokomotiv-2, sports complex of Irktusk and the main football arena — Lokomotiv for 3 thousand seats. 2012 Women's Bandy World Championship was hosted in Irkutsk and received praise from Federation of International Bandy. 2014 Bandy World Championship was played in the city. The final of Russian Bandy Super League 2016 was played at Rekord Stadium. The 2019 Bandy World Championship was scheduled to also be hosted in Irkutsk. The decision was reconsidered, though. Then it was thought that Irkutsk might get the right to host the 2020 tournament instead, if FIB was given guarantees that the planned indoor arena would be ready for use in time. It will also be an indoor speed skating arena. Its construction started in October 2018 and is expected to be ready for use by March 2020, just in time for the Bandy World Championship. Rudolf Nureyev (1938–1993), Soviet ballet and contemporary dancer and choreographer. Alexander Vampilov (1937–1972), Soviet playwright. ^ a b Lantzeff, George V., and Richard A. Pierce (1973). Eastward to Empire: Exploration and Conquest on the Russian Open Frontier, to 1750. Montreal: McGill-Queen's U.P. ^ a b "Мэр – Официальный портал города Иркутска". Retrieved December 5, 2015. ^ "Федеральная служба государственной статистики Российской Федерации – База данных показателей муниципальных образований". Retrieved March 17, 2016. ^ "International Calling Codes – Pg2". The-acr.com. Retrieved 2013-03-26. One or more of the preceding sentences incorporates text from a publication now in the public domain: Chisholm, Hugh, ed. (1911). "Irkutsk" . Encyclopædia Britannica. 14 (11th ed.). Cambridge University Press. p. 796. ^ Kennan, George (1891). Siberia and the Exile System. London: James R. Osgood, McIlvaine & Co. pp. 1–2. ^ Nechepurenko, Ivan (19 December 2016). "In Russia, Dozens Dies After Drinking Alcohol Substitute". The New York Times. Retrieved 19 December 2016. ^ "Russia bath lotion poisoning: Putin orders crackdown as death toll rises". BBC. 21 December 2016. Retrieved 21 December 2016. ^ Sarah Rainsford (29 December 2018). "Putin's Russia: Icy Siberia reveals cracks in society". BBC.com. Retrieved 30 December 2018. ^ "Pogoda.ru.net- Climate Data for Irkutsk 1981–2010" (in Russian). Weather and Climate (Погода и климат). Retrieved November 30, 2015. ^ "Irkutsk Climate Normals 1961–1990". National Oceanic and Atmospheric Administration. Retrieved November 30, 2015. ^ "Irkutsk Hydroelectric Power Station History". Irkutskenergo. Retrieved September 7, 2010. ^ John Pike (2002-09-18). "Irkutsk Aviation Industrial Association – Russian Defense Industry". GlobalSecurity.org. Retrieved 2014-02-07. ^ "Страница не найдена". Rusal.ru. Archived from the original on February 22, 2012. Retrieved March 26, 2013. ^ "IGTRK – Irkutsk branch of the State Television an Radio Broadcast Company". Irkutsk.rfn.ru. Retrieved February 7, 2014. ^ "AS Baikal TV". AS Baikal TV. Retrieved February 7, 2014. ^ "TV Company AIST". Aisttv.ru. Retrieved February 7, 2014. ^ "gorodtv.ru. Domain is, probably, for sale". gorodtv.ru. Retrieved December 11, 2018. ^ "VSP Newspaper Agency". Vsp.ru. Retrieved February 7, 2014. ^ "Аналитическая служба". Petropavlovsk.net. Archived from the original on September 14, 2010. Retrieved February 7, 2014. ^ "Irkutsk – Lonely Planet Travel and Information Guide". Lonelyplanet.com. Retrieved 2014-02-07. ^ "Irkutsk: Libertine Legacy by the Lakeside | Beyond Moscow". The Moscow Times. Retrieved 2013-03-26. ^ "Хоккейный клуб "Байкал-Энергия". Официальный сайт". Baikal-energy.ru. Retrieved 2013-03-26. ^ "Bandy2010.com". Bandy2010.com. Archived from the original on May 2, 2012. Retrieved March 26, 2013. ^ "WCS 2012 home page". Baikal-bandy.ru. Archived from the original on February 8, 2014. Retrieved February 7, 2014. ^ emh solutions. "A very well organized World Championship for Women in Irkutsk made a great success". Worldbandy.com. Archived from the original on February 3, 2014. Retrieved February 7, 2014. ^ "XXXIV Champ Of World Bandy". Baikal-bandy.ru. Archived from the original on February 8, 2014. Retrieved February 7, 2014. ^ emh solutions. "Russia world champions". Worldbandy.com. Archived from the original on February 19, 2014. Retrieved February 7, 2014. ^ "Google Translate". translate.google.com. Retrieved December 11, 2018. ^ "Google Translate". translate.google.co.uk. Retrieved December 11, 2018. Законодательное Собрание Иркутской области. Постановление №9/5-ЗС от 15 апреля 2009 г. «Устав Иркутской области», в ред. Закона №2-У от 14 декабря 2017 г. «О поправках к Уставу Иркутской области». Вступил в силу по истечении десяти дней после дня официального опубликования. Опубликован: "Областная", №45, 24 апреля 2009 г. (Legislative Assembly of Irkutsk Oblast. Resolution #9/5-ZS of April 15, 2009 Charter of Irkutsk Oblast, as amended by the Law #2-U of December 14, 2017 On the Amendments to the Charter of Irkutsk Oblast. Effective as of the day following a ten-day period after the day of the official publication.). Законодательное Собрание Иркутской области. Закон №49-ОЗ от 21 июня 2010 г. «Об административно-территориальном устройстве Иркутской области», в ред. Закона №12-ОЗ от 23 марта 2017 г. «О внесении изменений в статьи 25 и 33 Закона Иркутской области "Об административно-территориальном устройстве Иркутской области" и Закон Иркутской области "О порядке рассмотрения Законодательным Собранием Иркутской области предложений о присвоении наименований географическим объектам и (или) о переименовании географических объектов"». Вступил в силу после дня официального опубликования. Опубликован: "Областная", №71, 25 июня 2010 г. (Legislative Assembly of Irkutsk Oblast. Law #49-OZ of June 21, 2010 On the Administrative-Territorial Structure of Irkutsk Oblast, as amended by the Law #12-OZ of March 23, 2017 On Amending Articles 25 and 33 of the Law of Irkutsk Oblast "On the Administrative-Territorial Structure of Irkutsk Oblast" and the Law of Irkutsk Oblast "On the Procedures for Consideration of Assignments of Names to Geographical Objects and (or) Renaming of Geographical Objects". Effective as of after the day of the official publication.). Законодательное Собрание Иркутской области. Закон №88-оз от 16 декабря 2004 г. «О статусе и границах муниципального образования "город Иркутск" Иркутской области». Вступил в силу с 31 декабря 2004 г., но не ранее чем через 10 дней со дня официального опубликования. Опубликован: "Восточно-Сибирская правда", №254–255, 20 декабря 2004 г. (Legislative Assembly of Irkutsk Oblast. Law #88-oz of December 16, 2004 On the Status and Borders of the Municipal Formation of the "City of Irkutsk" of Irkutsk Oblast. Effective as of December 31, 2004, but not earlier than 10 days after the official publication date.). Законодательное Собрание Иркутской области. Закон №94-оз от 16 декабря 2004 г. «О статусе и границах муниципальных образований Иркутского района Иркутской области», в ред. Закона №106-ОЗ от 6 ноября 2012 г. «О внесении изменений в Закон Иркутской области "О статусе и границах муниципальных образований Иркутского района Иркутской области"». Вступил в силу с 31 декабря 2004 г., но не ранее чем через 10 дней со дня официального опубликования. Опубликован: "Восточно-Сибирская правда", №254–255, 20 декабря 2004 г. (Legislative Assembly of Irkutsk Oblast. Law #94-oz of December 16, 2004 On the Status and Borders of the Municipal Formations of Irkutsky District of Irkutsk Oblast, as amended by the Law #106-OZ of November 6, 2012 On Amending the Law of Irkutsk Oblast "On the Status and Borders of the Municipal Formations of Irkutsky District of Irkutsk Oblast". Effective as of December 31, 2004, but not earlier than 10 days after the official publication date.). Polunina N.M., Korobov S.A., Sutton J.M., Korobova G.W. Her Majesty — Queen of Siberia // Publishers Korobov. — Irkutsk, 2008. 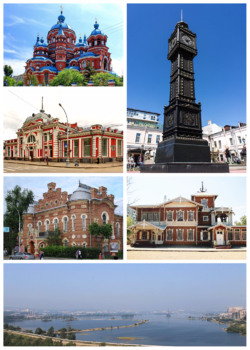 Wikivoyage has a travel guide for Irkutsk. Wikisource has the text of a 1905 New International Encyclopedia article about Irkutsk.